The Exeter Northcott Theatre and Creative Cow are delighted to announce the cast for their magical new adaptation of Charles Dickens’ much-loved Christmas classic. Leading the cast is celebrated local actor, Derek Frood, in the role of Ebenezer Scrooge. Derek was recently seen in BBC1’s Poldark and has previously entertained Devon audiences in his work with Theatre Alibi. Making his Exeter Northcott Theatre debut is Cygnet Theatre trained Ed Ferrow in the roles of both Jacob Marley and Bob Cratchit. Creative Cow co-founder Katherine Senior will play the roles of Mrs Fezziwig and Mrs Cratchit. Darren Lake will play the roles of Ghost of Christmas Present and Fezziwig. Darren has played leading roles in shows as diverse as Maggie May, Tales from the Vienna Woods, The Hired Man, Oh! What A Lovely War. Séan Aydon will play the Ghost of Christmas Past, the first of the three spirits to haunt Ebenezer Scrooge. Séan recently appeared in the world premiere of Arthur Miller’s The Hook in a co-production between Northampton’s Royal & Derngate and the Liverpool Everyman. Fred and Young Scrooge will be played by George Jennings. George has worked with Creative Cow before in the role of Young Marlow in She Stoops to Conquer. South West musician Jamie Huddlestone will bring elegant music to the production. Completing the cast is John Dunlop, from Exeter, who will play the role of Tiny Tim. Ebenezer Scrooge is a notoriously bitter old man who is determined not to let Christmas interfere with his miserly routine. But one Christmas Eve, Scrooge receives some unexpected supernatural visitors who are determined to show him the true spirit of Christmas and the error of his ways. Creative Cow’s artistic director Amanda Knott directs an ensemble company of actors and musicians to bring you this magical, inventive, heart-warming adaptation of a festive classic, with Dickens wit and masterful storytelling at its core. Guaranteed to appeal to young and old alike, A Christmas Carol will melt even the coldest of hearts and leave all rejoicing with Christmas spirit. For more information, please contact Jenny Hogg on 01392 722409 or email her. A Christmas Carol is co-produced by Exeter Northcott Theatre and Creative Cow. Exeter Northcott Theatre is a 460 seat venue serving Exeter and heart of Devon from its home on the University of Exeter Streatham Campus. It offers a mixed programme of touring theatre productions, contemporary dance, opera, music, comedy and family shows to its catchment area of 551,000 homes. Creative Cow is a touring repertory theatre company formed in 2007 by Amanda Knott, Jonathan Parish and Katherine Senior. Their aim is to present to wide and diverse audiences the very best in classic and contemporary playwriting with imaginative and accomplished performances. 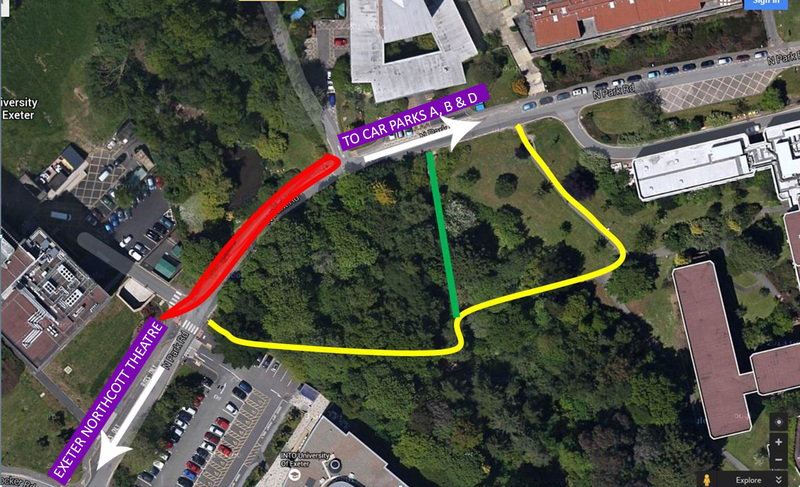 Please note that Exeter University will be undertaking some building work on its pedestrian paths between car parks A, B & D and the theatre from Monday 2 – Friday 20 November. The university have put on alternative pedestrian routes which will be lit and sign posted. We are advising that our patrons leave a little extra time when using these routes. Although the footpaths will be closed the road will still be accessible to cars. The picture below shows the footpath closure in red and the alternative footpaths in yellow and green. Please be aware that the yellow footpath is steeper than the green. For more information please call our box office on 01392 72 63 63. Green Day’s explosive Tony Award® winning Broadway musical American Idiot, will embark on a national tour and visit Exeter Northcott Theatre in May 2016. Following on from its hugely successful and critically acclaimed West End run, which is currently running at the Arts Theatre, Leicester Square until 22 November 2015. American Idiot will begin its UK tour from 19 March 2016, commencing at the Curve Theatre, Leicester, directed and choreographed by Racky Plews, with designs by Sara Perks, lighting by Tim Deiling, sound by Chris Whybrow and musical supervision by Richard Morris. Amelia Lily (X-Factor) will be reprising her critically acclaimed role, Whatsername, from 5 April at the Palace Theatre, Manchester, with full casting to be confirmed in due course. Amelia Lily (Whatsername) is a singer who finished third on the eighth series of The X Factor in 2011, mentored by Kelly Rowland. Her debut single, “You Bring Me Joy”, was released in 2012 and reached number two on the UK Singles Chart, while her follow-up singles “Shut Up (and Give Me Whatever You Got)” and “Party Over” (both 2013) reached the top 20 and the top 40 respectively. Amelia made her West End debut, earlier this year, in American Idiot the musical and previously starred as the Narrator in the UK tour of Joseph And His Amazing Technicolor Dreamcoat. Vocalist/guitarist Billie Joe Armstrong, Bassist Mike Dirnt, and Drummer Tré Cool – were kids from working-class backgrounds who came of age in the underground punk scene in Berkeley. Even though they had released two records prior (1039 / Smoothed Out Slappy Hours and Kerplunk), they announced their arrival with 1994’s Dookie, a dynamic blast of exuberant punk-pop that sold 15 million copies and earned the band its first Grammy® Award for Best Alternative Music Performance. Over the years, Green Day continued to top the charts with their subsequent studio albums Insomniac, Nimrod and Warning, while entertaining millions of fans with their frenetic live shows. But it was their landmark 2004 album American Idiot that launched Green Day into the stratosphere. American Idiot debuted at No. 1 on the Billboard chart, spawned five hit singles, earned seven Grammy® nominations (winning two, including Best Rock Album), and raised the bar for modern rock and roll. In 2009, Green Day released 21st Century Breakdown, which won the 2010 Grammy® Award for Best Rock Album. It spawned two hit singles: the gold “Know Your Enemy,” which was the first song ever to top Billboard’s Rock, Alternative, and Mainstream Rock charts simultaneously, and the double-platinum “21 Guns,” which earned them three 2009 MTV Video Music Awards including Best Rock Video. Green Day also took home an American Music Award for Favourite Alternative Rock Music Artist. Later that year, Green Day collaborated with Tony Award winning director of Spring Awakening, Michael Mayer, for the stage musical of American Idiot. The play bowed at the Berkeley Repertory Theatre in September 2009 and set attendance records during its limited engagement. The play went on to Broadway and ran for a year at the St. James Theatre and won two Tony Awards Green Day’s highly anticipated album trilogy kicked off with the release of Green Day ¡Uno!, (September 25, 2012) followed by Green Day ¡Dos! (November 13th), and Green Day ¡Tré! (December 11th). The band recently completed the Soundwave Festival in Australia. For more info visit www.greenday.com. Ian Seraillier’s highly acclaimed and much-loved children’s novel, THE SILVER SWORD, has been adapted for the stage and will visit Exeter at the end of October. The Silver Sword is a heart-warming tale of three children whose determination to become a family again, takes them on an incredible adventure to find their father against all the odds. Named by The Times as one of the top 50 children’s books of all time, The Silver Sword is set in Poland in the immediate aftermath of WWII and follows the Balicki children’s search for safety as Europe is divided up and displaced people return to their homelands. Along the way, Ruth, Edek and Bronia meet 14 year old Jan – a boy who, years before, had met their father by chance and been given the family’s precious paper knife, affectionately known as the Silver Sword. Jan’s instructions are to show it to the children, should their paths cross, with the message that their father is still alive and headed for Switzerland. This brand new musical adaptation of The Silver Sword is full of warmth, music and excitement, and is brought to life by a cast of wonderful actor/musicians, featuring amazing puppetry and stunning visual projections. The cast are available for interviews. Agatha Christie’s famous novel, A Murder is Announced, is brought to life on the Exeter Northcott staged in October. Miss Marple, along with Hercule Poirot, is one of Agatha Christie’s most loved characters, having been portrayed many times on screen. She’s appeared in 12 of Agatha Christie’s crime novels and in 20 short stories, numerous TV adaptations and on the radio too. Starring Judy Cornwell as Miss Marple and Diane Fletcher (House of Cards) who both have distinguished careers spanning 50 years on stage and screen. Judy Cornwell is best known for playing the loveable Daisy in Keeping Up Appearances. They are joined by Tom Butcher (PC Steve Loxton in The Bill and Dr Marc Elliott in Doctors), Sarah Thomas, who played Glenda Wilkinson in Last of The Summer Wine for 24 years, Rachel Bright (EastEnders’ Poppy Meadow) and Dean Smith (Waterloo Road, Last Tango in Halifax).